1 edition of Go to the Deep found in the catalog. Add another edition? Are you sure you want to remove Go to the Deep from your list? Published 2006 by Sophia Press . 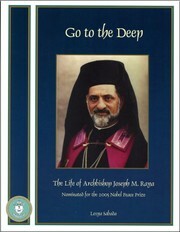 Go to the Deep is a lovely tribute to “one of the most remarkable souls to grace our Church in recent years” says Archbishop Cyril in his preface to the book. From every page of this book shines forth evidence of Archbishop Joseph's all-consuming and delightfully enthusiastic love for God, His Church, His people, and our Byzantine Melkite spiritual tradition. This sumptuously illustrated book, lovingly assembled by Lesya Sabada, takes you through fifty years of the holy Archbishop's exciting and eventful life, bringing his words and deeds vividly to life again through the testimonies of those who knew him well and loved him dearly. Go to the Deep represents an edited version of the voluminous testimony sent to the Nobel Peace Prize Committee in support of Archbishop Joseph Raya's nomination for the Nobel Peace Prize in 2005. February 25, 2017 Edited by Todays Martyrs Reviewer Edited without comment. February 25, 2017 Created by Todays Martyrs Reviewer Added new book.